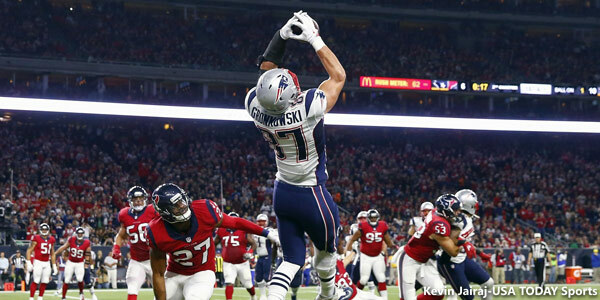 Week 10 is highlighted by the return of the New England Patriots to NFL action. The 7-1 Pats host the 5-2-1 Seattle Seahawks in a rematch of Super Bowl 49, arguably the best championship game in professional football history. The game kicks off at 8:30 pm eastern time at Gillette Stadium in Foxborough and will be televised on NBC. Broadcast in northern Florida (Jacksonville, Gainesville), southern Georgia (Savannah) and Texas (except Dallas). Jacksonville’s change at offensive coordinator to Nathaniel Hackett had mixed results. The Jaguars moved the ball very well against the Chiefs, with season highs in total yards (449) and rushing (205 yards). Those numbers are nice, but useless if you cannot finish off drives. The Jags moved the ball 66 yards on their first two drives but both ended in punts. Two drives (62 yards, 33 yards) ended on failed fourth down attempts. There was also a 74 yard drive that was done in by a fumble, and another ended with a missed field goal. Most egregiously Jacksonville turned the ball over four times. If you want to know why Jacksonville has not lived up to the preseason hype, look no further than their 17 giveaways this season. The Jaguars own the NFL’s worst turnover differential (-12), which is a difficult task considering the Jets’ propensity to gift opponents with an interception. Broadcast in Illinois (except Chicago), Iowa, Kansas, Missouri, Nebraska, North Carolina, Oklahoma, South Carolina and Virginia. Kansas City’s defense has taken a step back this year. The Chiefs have had trouble stopping the run, allowing opponents to rush for 4.8 yards per carry (30th) and 125 yards per game (27th). That of course plays right into Carolina’s offensive game plan, to run the ball early and often. Since their week seven bye the Panther defense has played much better, averaging 15.0 points against. Thomas Davis has been particularly effective. Last week the 12th-year linebacker had 11 tackles (10 solo), an interception, pass defensed, strip sack and forced fumbled in the victory at Los Angeles. Broadcast in all markets with the exception of those televising one of the three other CBS games: Houston-Jacksonville, Kansas City-Carolina and Miami-San Diego. The league’s top-ranked passing offense faces the NFL’s top-ranked passing defense in what should be the best of the eight early games. The New Orleans offense ranks first in total yards (435 per game), third down conversion (53%), passing yards (326 per game) and is second in scoring (30.2 ppg), red zone scoring (70.6%) and pass completions (69.7%). While the Saint offense is a handful, their defense is another story. The Saints rank last in yards per pass attempt (8.1), yards per play (6.4), passing yards (300 per game) and 30th in both points allowed (29.8) and total yards (409). The good news for the Saints is that there defense has played better lately. After surrendering at 34 points in four of their first five games New Orleans has given up 23.3 points per game over the last three weeks. The Saints are also a much better team playing in the Big Easy. In their last two home games the Saints have defeated the Panthers and Seahawks. Overall New Orleans has won four of their last five to quietly close the gap in the NFC West; the Saints are now just one game behind Atlanta in the loss column. The Denver pass defense ranks first in yards per game (183), yards per pass (5.2) and completion percentage (54.6%). The Broncos have been vulnerable on the ground however, and the Saints have rushed for 475 yards in their last three games. Denver is giving up 129 yards rushing per game (29th) and 4.4 yards per carry (22nd). Denver quarterback Trevor Siemian has completed just 52% of his passes over the last three weeks, and Denver has turned the ball over five times in their last two games. The Broncos appear to be heading in the opposite direction as the Saints, losing three of their last five games. If New Orleans can continue to run the ball well then that will help neutralize Von Miller and the Denver pass rush. On the other hand should Denver be able to do the same then that takes pressure off Siemian – and also keeps Drew Brees and the Saint offense off the field. Broadcast in southern California (except San Diego), Connecticut and New York (except Syracuse). Both defenses should be able to pressure the opposing quarterback into making mistakes. And both offenses need to utilize their running backs more than they have been recently. Todd Gurley has run the ball just 14, 15 and 12 times over the last three games for the Rams, while Jeff Fisher has inexplicably had Case Keenum drop back to pass 106 times in the last two games. Similarly Matt Forte ran the ball just twelve times for the Jets last week even though he averaged 7.7 yards per carry – and Ryan Fitzpatrick threw two more picks in the loss to Miami. The Jets now lead the league with 19 turnovers and have a minus-11 turnover differential. Broadcast in New England (except CT), Alabama, Arkansas, northern California, San Diego CA, south Florida (Miami, West Palm Beach), Florida panhandle (Panama City, Tallahassee), Georgia, Idaho, Topeka KS, Kentucky, Louisiana (except New Orleans), Mississippi, Missouri (except Springfield), Nevada, New Mexico, Syracuse NY, Oregon, Pennsylvania, South Carolina, Texas (except Houston) and Washington. The Falcons face a tough challenge this week, attempting the rare feat of winning on the road in back-to-back weeks. Last week Atlanta’s unstoppable offense went over 40 points for the fourth time. After losses to Seattle and San Diego the Falcons bounced back with wins against Green Bay and Tampa Bay. Atlanta’s defense can’t stop a nosebleed, but it doesn’t matter; five times the Falcons have won games despite giving up 28 or more points. Philadelphia began the season 3-0 but has lost four of their last five games. All of those four losses were by seven or fewer points, and all were on the road. Philly needs to get back to protecting the ball better. The Eagles did not turn the ball over until week five, but have coughed it up seven times in the last three games. Eagle RT Halapoulivaati Vaitai has struggled since being thrust into the starting lineup due to Lane Johnson’s suspension. Vaitai will have his hands full against Atlanta DE Vic Beasley, who has 7½ sacks. Broadcast in DC, Iowa (except Cedar Rapids), Maryland, Minnesota, Montana, North Carolina (except Charlotte), North Dakota, Oklahoma, South Dakota, Virginia and West Virginia. The Vikings are in a free-fall, losing three straight after beginning the season 5-0. Minnesota is averaging just 12.0 points per game during that span, with their offensive line proving to be incapable of either pass protection or run blocking. Couple that with an unreliable kicker – Blair Walsh has missed four field goals and three PAT – and Minnesota just can’t be expected to score enough to win. Broadcast in Alaska, Arizona, Chico CA, Colorado, Hawaii, Cedar Rapids IA, Wichita KS, Michigan, Nebraska, Cincinnati OH, Cleveland OH, Springfield MO, St. Louis MO, Tennessee, Utah, Wisconsin and Wyoming. The Packers should have the NFC North virtually wrapped up by now, but after losing three of their last four games – including three straight at Lambeau – find themselves in jeopardy of missing the playoffs. This will be the first of three straight road games for the Pack, who looked sluggish in last week’s loss to a mediocre Indianapolis team. Tennessee’s offense is playing better than it did at the start of the season, but their defense has regressed. The Titans allowed 19.0 points per game in September but have given up 31.3 points per game over the last four weeks. Broadcast in central Florida (Fort Myers, Ocala, Orlando and Tampa), Illinois and Indiana. Tampa Bay’s defense is not getting the job done. The Bucs are allowing 29.0 points per game (29th), 399 yards per game (28th), 6.0 yards per play (28th), 118 rushing yards per game (28th), 281 passing yards per game (28th), 7.9 yards per pass attempt (30th), and are giving up red zone touchdowns 65.5% of the time (28th). Wide receiver Alshon Jeffrey should be in line for a big game. The Bucs have given up 37 pass plays of 20 or more yards, which is the second most in the NFL. There is no home field advantage here; the Bucs are 0-4 at RayJay and the heat and humidity are no longer factors for visiting teams this late in the year. Broadcast in Yuma AZ, southern California, DC, Florida (except Jacksonville), Georgia (except Savannah), Chicago IL, Minnesota, New York City, Philadelphia PA, Nashville TN and Wisconsin. San Diego’s offense is clicking on all cylinders. The Chargers are averaging 29.8 points per game (3rd) and have scored 27 or more points six times this season. Melvin Gordon now has 1052 yards from scrimmage, second most in the NFL. Miami counters with their own star running back. Jay Ajayi is averaging 5.9 yards per carry and has rushed for 529 yards in the last three games. His productivity has taken pressure off quarterback Ryan Tannehill to carry the team, resulting in three straight wins for the Dolphins. A referendum that would have raised hotel occupancy taxes to help pay for a new stadium for the Chargers in San Diego failed to pass in last week’s election. I will be curious to see if Mike McCoy will be able to convince his players to ignore the noise and focus on the game. Broadcast in Arizona, northern California and Reno NV. Normally I would back any NFL team getting 14 points against a sub-.500 team, but these Niners are awful. San Francisco ranks last by a wide margin in virtually every run defense metric, including an unfathomable 193 yards per game. Now the Niners have to go on the road and face one of the best running backs in the league. David Johnson leads the NFL with 139 yards from scrimmage per game and is averaging 4.5 yards per carry. Broadcast in all markets with the exceptions of Arizona, northern California, San Diego CA and Reno NV. The Cowboys have been televised in either prime time or as the primary afternoon game every week this season, but nobody should complain about that this week. With linebacker Ryan Shazier back in the lineup Pittsburgh’s defense, especially against the run, is vastly improved. The Steelers need to limit Cowboy running back Ezekiel Elliott from gaining large chunks of yardage. The problem is that is more easily said than done when going up against one of the two best offensive lines in the NFL. Ben Roethlisberger had his traditional poor performance in his first game back from an injury, but should have a better day versus a Dallas defense that is allowing opponents to complete 68% of their passes (third worst in the NFL). Multiple changes in personnel and injuries have made the Seattle offensive line a liability. The result is a change in personality for the Seattle offense, with a running game that is one of the least effective in the league. That won’t help keep the Patriot offense off the field. The return of Tom Brady from a witch hunt suspension and Rob Gronkowski from a preseason hamstring injury have propelled New England’s into an unstoppable juggernaut. The Patriots are averaging 34 points per game over the last four weeks, winning by an average margin of more than 16 points per game. Seattle has benefited from officiating decisions in three of their five wins, including an outrageous non-call against Richard Sherman for roughing the kicker against Buffalo last week. You know the officiating is bad when there was no flag, yet a player is fined for the hit. This game won’t be close enough to come down to a referee’s arbitrary decision though. For more on this game check out Seahawks at Patriots: In-Depth Team Stats, Odds and More. Cincinnati was saddled with a tough schedule to start the season, with games at Pittsburgh, Dallas and New England. If they are going to make it to the post-season then they need to find a way to win games like this one. The Bengal offense moves the ball well (395 yards per game, 6th) but doesn’t finish drives off well. Cincy ranks 21st on third down (36.9%) and scores touchdowns in the red zone just 52% of the time (19th). To make matters worse the Bengals not only settle for too many field goals, they are converting only 77% of their attempts (25th). New York’s offensive line has not played well. The running game is so ineffective (3.2 yards per rush, 68 yards per game) it has virtually been abandoned. The Giants pass the ball on 65% of their plays, second most in the league, making them very predictable to defend. Last week began well, picking Atlanta to win and cover (one unit) and the total at Tampa to go over (three units). The Saints over San Francisco was another road win, good for three units. However Green Bay losing at home to the Colts was a disappointment, costing me two units ATS and also prevented me from winning what would have been 600 on a parlay. 67-38-2, +7610 on original $2310 risk. 329.4% ROI on original $2310 bankroll. 39.3% ROI on $19,360 (176 units) of total weekly investments. This entry was posted in NFL Commentary, Uncategorized and tagged 2016 NFL Season, announcers, Atlanta Falcons, betting line, Carolina Panthers, CBS, Cincinnati Bengals, Dallas Cowboys, Denver Broncos, ESPN, FOX, Green Bay Packers, Kansas City Chiefs, Miami Dolphins, Minnesota Vikings, NBC, New England Patriots, New Orleans Saints, New York Giants, odds, Pittsburgh Steelers, San Diego Chargers, Seattle Seahawks, Super Bowl XLIX, television, tv, vegas, Washington Redskins, Week 10 on November 13, 2016 by John Morgan. NFL Week Ten is highlighted by a rematch of Super Bowl 49. 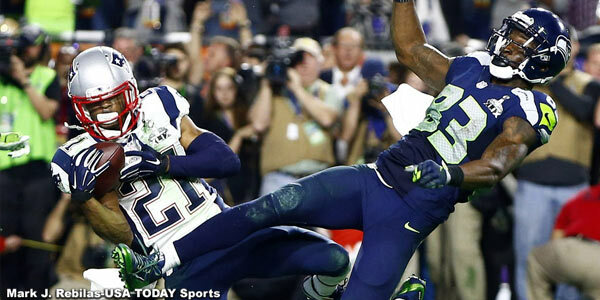 On Sunday night the 7-1 New England Patriots host the 4-2-1 Seattle Seahawks on NBC. Al Michaels (play by play), Cris Collinsworth (commentary) and Michele Tafoya (sideline reports) will serve as the broadcasting crew. On the Sunday afternoon undercard there are several interesting games worth tuning in to view. CBS has the single game and most of their affiliates will be broadcasting Denver at New Orleans in the early time slot. Oakland was able to neutralize Von Miller and the vaunted Denver pass rush last night en route to a 30-20 victory. The defending Super Bowl champs have now lost three of their last five games. The Broncos have lost their last two road games and suddenly find themselves in third place in the AFC West. Fox has the doubleheader this week and their early time slot is primarily split between two games. Most of the northeast and southeast will receive Atlanta at Philadelphia. The Falcons own the second best record in the NFC but face the challenge of going out and winning on the road for the second time in two weeks. Philadelphia has stumbled recently with four losses in their last five games, but the Eagles are 3-0 at home this year. The other early game on Fox receiving wide distribution is Green Bay at Tennessee. The Packers look to rebound after a lackluster performance in their Sunday night loss to the Colts. This game will air through much of the north central United States as well as almost all of the Rocky Mountain and Pacific time zones. In the late time slot Fox is once again showcasing the Dallas Cowboys. This week Dallas is at Pittsburgh, which makes for a compelling matchup. The Steelers have lost three in a row but perform much better at home with the backing of Steeler Nation and their Terrible Towels. Pittsburgh’s sole home loss this year was without Ben Roethlisberger as well as a depleted wide receiving corps against the New England Patriots. Thursday night brings us yet another stinkfest, with the Browns traveling to Baltimore to face the Ravens. The final prime time game on Monday is between the Bengals and Giants. Buffalo, Detroit, Indianapolis and Oakland are all off with byes in Week 10. Please keep in mind that the listings below are preliminary. Some stations will switch to another game between now and Sunday. Broadcast in northern Florida, southern Georgia and Texas. Broadcast in Illinois (except Chicago), Iowa, Kansas, Missouri, Nebraska, North Carolina, South Carolina and Virginia. Broadcast in all markets with the exception of those broadcasting one of the three other CBS games: Houston-Jacksonville, Kansas City-Carolina and Miami-San Diego. Broadcast in southern California (except San Diego), Hartford CT and New York (except Buffalo). Broadcast in New England (except CT), Alabama, Arkansas, south Florida (Miami, West Palm Beach), Florida panhandle (Panama City, Tallahassee), Georgia, Kansas (except Topeka), Louisiana (except New Orleans), Mississippi, New Mexico, Buffalo NY, Oklahoma, Pennsylvania, South Carolina and Texas. Broadcast in DC, Maryland, Minnesota, North Carolina (except Charlotte), Montana, North Dakota, South Dakota and West Virginia. Broadcast in Alaska, Arizona, northern California, San Diego CA, Colorado, Hawaii, Idaho, Iowa, Kentucky, Michigan, Nebraska, Nevada, Ohio, Oregon, Tennessee, Utah, Washington, Wisconsin and Wyoming. Broadcast in Yuma AZ, southern California, central and southern Florida (Fort Myers, Miami, Orlando, Tampa, West Palm Beach), Atlanta GA, Minnesota, New York City, Philadelphia PA, Nashville TN and Wisconsin. This entry was posted in NFL Commentary, Uncategorized and tagged 2016 NFL Season, announcers, Atlanta Falcons, betting line, Carolina Panthers, Cincinnati Bengals, Dallas Cowboys, Denver Broncos, Kansas City Chiefs, Miami Dolphins, Minnesota Vikings, New England Patriots, New Orleans Saints, New York Giants, odds, Philadelphia Eagles, Pittsburgh Steelers, San Diego Chargers, Seattle Seahawks, television, tv, vegas, Washington Redskins, Week 10 on November 7, 2016 by John Morgan. Week 8 is highlighted by a chance for the New England Patriots to avenge their only loss of the 2016 season. The Pats travel to Buffalo seeking their fourth straight win while the Bills look to rebound from last week’s loss to Miami. Back in week four an emotionally spent New England team lost to the Bills after shockingly beginning the season 3-0, much to the chagrin of every person who has ever had an office at 345 Park Avenue. The game kicks off at 1:00 pm eastern time and will be carried by many CBS stations in the eastern United States. In the first game between these two original AFL rivals at Foxboro the Bills handed the Patriots their sole loss of the season. With rookie Jacoby Brisset under center Buffalo dominated, shutting the Pats out 16-0. Even though the Patriots are on the road against a 4-win team, the handicappers at the Westgate Las Vegas SuperBook have listed the Pats as the second biggest favorite of the week. Meanwhile Roger Goodell and his minions have become a text book example of how to not arrogantly and condescendingly alienate your customers. It is amazing to see how such highly paid people turn one event after another in to such public relation blunders. The fact that Goodell remains in office speaks volumes about the lack of character of many NFL owners. Cincinnati is the better team on paper but the Bengals still seem to be hungover from their epic playoff meltdown in early January. However, Washington is missing three key players: Josh Norman, Trent Williams and Brandon Scherff. Without Norman on defense and those two offensive linemen the Skins are very beatable. Broadcast in Illinois, Indiana (except Indianapolis), Iowa, Michigan, Minnesota, North Dakota, South Dakota, Texas, Wisconsin and Nashville TN. After losing three straight by a total of eleven points Detroit won three in a row at home by a total of seven points. The Lions should be able to take advantage of Houston’s mediocre run defense (4.4 yards per carry, 135 yards per game) and inconsistent passing game. Seattle played five tough quarters of football last Sunday night and now has to travel 2600 miles across two time zones. In the last seven games road teams coming off a 0-7, losing by an average of 19.3 points per game. The Saints should have won their third in a row last week at Kansas City. A well thrown pass by Drew Brees was tipped and returned for a pick six, turning out to be the difference in a 27-21 loss. Seattle’s defense is banged up and after appearing to gel, the Seahawk offensive line has taken a step backwards. That’s bad news for Pete Carrol’s crew. The Saints are averaging 36 points per game at home. Broadcast in Arizona, North Carolina, South Carolina and western Virginia. Arizona is in the same situation as Seattle, making a long road trip for an early game after a long, tough game Sunday night. Even though the Carolina secondary is not as effective as a year ago, Carson Palmer has regressed even more so. Carolina has had a tough schedule, they are better than their record indicates. The Panthers have lost to Minnesota and have three road losses to decent teams. Carolina has lost at Denver, New Orleans and Atlanta; their other loss was with Derek Anderson at quarterback. Broadcast in New England, Alabama, Alaska, Arkansas, DC, south Florida (Fort Myers, Tampa and West Palm Beach), Georgia, Hawaii, eastern Kentucky, Louisiana (except Baton Rouge and New Orleans), Maryland, Michigan (except Detroit and Flint), Minnesota, Mississippi, New York (except NYC), North Carolina (except Charlotte), Oklahoma, Pennsylvania (except Scranton), South Carolina, Tennessee (except Knoxville), Texas (except Houston), Virginia, West Virginia, Wisconsin, Chicago IL, Cincinnati OH and Las Vegas NV. In ‘revenge’ games against a team that they lost to earlier in the season, the Patriots are 8-0 with Tom Brady at quarterback. The combined score of the last four of those games is 166-51. Nose Tackle Marcel Dareus returns to the lineup for Buffalo, but the Bills will be without RB LeSean McCoy, WR Marquise Goodwin and DT Jerel Worthy. Broadcast in New York City, Ohio (except Cincinnati) and Scranton PA. The Browns have to win at least one game this year, right? Broadcast in northern California, north and central Florida, and Reno NV. The Raiders spent the week in Florida, so jet lag and an early kickoff is not an issue. The Bucs are fortunate to be 3-3. Two weeks ago they faced Carolina without Cam Newton, and last week they played San Francisco. Broadcast in Illinois (except Chicago), Indiana, Iowa, western Kentucky, Missouri, Nebraska, Fargo ND and Knoxville TN. The Colt defense is not good at all. Indy is allowing opposing quarterbacks to complete 68% of their passes (30th)and is tied with New Orleans with a league-low two interceptions. Kansas City’s balanced offense and bend but don’t break defense should be able to do just enough for a close road win. Broadcast in Arizona, southern California, Colorado, Idaho, southern Louisiana (Baton Rouge and New Orleans), eastern Michigan (Flint and Detroit), Montana, New Mexico, Charlotte NC, Bismark ND, Portland OR, South Dakota, Houston TX, Utah, Washington, and Wyoming. San Diego won the first meeting between these two rivals, but circumstances are different now. This time the game is at Mile High, Gary Kubiak is back coaching and Trevor Siemian is healthy for Denver. Winning back-to-back road games is rare in the NFL. San Diego is not only facing that challenge, but also coming off an overtime game on the road. Then there is the Denver defense playing at home. There are too many factors that are not in the Chargers’ favor. Broadcast in all markets with the exception of Denver. The Packers will be well rested, having last played in an easy 26-10 victory over the Bears ten days ago. Atlanta may be at home but they played to overtime last week. Aaron Rodgers should have a big game against a Falcon defense that is allowing opponents to complete 67% of their passes. The Eagles surrendered 230 rushing yards to Washington two weeks ago. If Philly couldn’t stop the Skins’ ground game, how can they slow down Ezekiel Elliott? Should Philadelphia stack the box and sell out to stop the run, that just opens up the passing game. Dallas gets WR Dez Bryant back after missing three games due to a knee injury. After losing their first game of the season the Vikings will be highly motivated. By the time this one is over Jay Cutler will be wishing that he was still on the sideline as a backup. As expected the Jags showed that they are not yet ready for prime time. Maybe next year. As evidenced by the paltry amount of wagers, I didn’t feel particularly strongly on any games last week – and it showed in the results. In retrospect it made no sense to venture on either a parlay or teaser considering that lack of confidence. Worst decision was backing a Minnesota team overdue for a loss. That one cost me not only on the Vikings-Eagles game, but also on a four-game teaser. Easiest bet was on Atlanta-San Diego being a high scoring game. 49-32-2, +3290 on original $2310 risk. 142.4% ROI on original $2310 bankroll. 28.6% ROI on $14,520 (132 units) of total weekly investments. This entry was posted in Uncategorized and tagged 2016 NFL Season, AFC, AFC East, AFC South, AFC West, against the spread, Atlanta Falcons, betting line, Buffalo Bills, CBS, Chicago Bears, Dallas Cowboys, Denver Broncos, ESPN, FOX, Green Bay Packers, Minnesota Vikings, NBC, New England Patriots, New Orleans Saints, NFC East, NFC North, NFC South, odds, Philadelphia Eagles, picks, predictions, San Diego Chargers, Seattle Seahawks, television, tv, vegas on October 30, 2016 by John Morgan. On Wednesday afternoon the Westgate Las Vegas Superbook released their advanced betting lines, also known as look-ahead lines. These early lines give some clairvoyant risk takers an opportunity to roll the dice on games that will not be played for another week and a half. There are times when public reaction to the most recent game clouds reality, and for a moment one can exploit the odds on an overrated or underrated team – or be done in by an unforeseen injury. Week 8 features a rematch between New England and Buffalo. In the first game between these two original AFL rivals at Foxboro the Bills handed the Patriots their sole loss of the season. With rookie Jacoby Brisset under center Buffalo dominated, shutting the Pats out 16-0. Even though the Patriots are on the road against a 4-2, the handicappers at the Westgate have listed the Pats as the second biggest favorite of the week. Another team seeking payback for an earlier loss is Denver. The Broncos were stunned in front of a national audience last Thursday at San Diego, overpowered by a feisty Charger team that once again attempted to give the game away in the final minutes. In the largest spread of the week the Broncos are favored by seven. At the other end of the spectrum Oakland at Tampa Bay is listed as a pick’em. The next closest line belongs to a game between two teams that have not lived up to preseason expectations. 1-5 Carolina is a one-point home favorite versus Arizona. The Panthers are coming off a bye while the 3-3 Cardinals look to keep momentum going after demolishing the Jets 28-3. The Baltimore Ravens, Los Angeles Rams, Miami Dolphins, New York Giants, Pittsburgh Steelers, San Francisco 49ers are all off with a bye. As for Thursday’s game, Green Bay should win at home easily. Something does seem off with the Packer offense, whether it be the play calling or Aaron Rodgers adjusting to footballs that are not over-inflated. Green Bay’s defense is improved over recent years however, and Chicago does not have the level of talent to keep up. 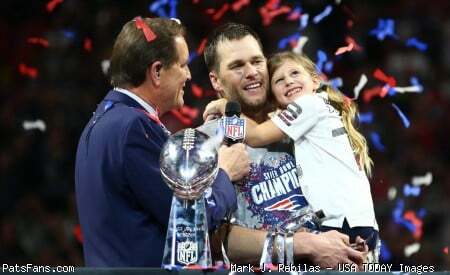 This entry was posted in Patriots News, Uncategorized and tagged 2016 NFL Season, AFC, AFC East, Arizona Cardinals, betting line, Buffalo Bills, Carolina Panthers, CBS, Denver Broncos, ESPN, ESPN Monday Night Football, FOX, NBC, New England Patriots, Oakland Raiders, odds, Patriots, Pats, San Diego Chargers, Tampa Bay Bucs, television, tv, vegas, Week 8 on October 19, 2016 by John Morgan. Week 7 features a highly anticipated game between two of the NFL’s best teams. 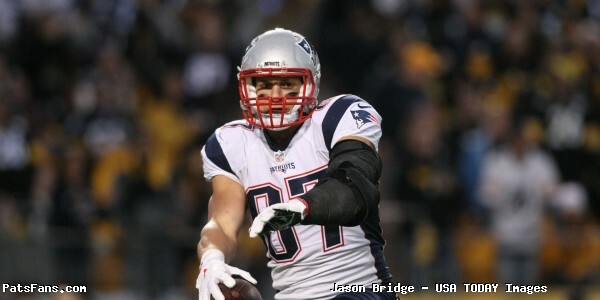 The New England Patriots travel to Pittsburgh to take on the Steelers in a battle for supremacy in the AFC. Although the game is being played at Heinz Field, some Vegas handicappers have determined that the Patriots are a formidable enough team to negate the hometown advantage at Heinz Field. In a bit of an anomaly this is one of four games listed at even odds. The big game kicks off at 4:25 pm eastern time a week from Sunday. The showdown will be televised on CBS and will be available in all but two markets (Atlanta and San Francisco) in the US. As a prelude the Patriots host Cincinnati this weekend, and Pittsburgh is at Miami. Here is a look ahead at the full Week 7 schedule and their initial odds. Carolina and Dallas will be off with a bye. As for tomorrow night’s game, perhaps it is wishful thinking – but San Diego is overdue for a win. The Chargers have played well enough to be 5-0 – if the games were just a few ticks short of 60 minutes long. Which team is going to win one for the gipper? Denver, with their head coach hospitalized? Or San Diego, with Mike McCoy one more last-minute loss away from probably being fired? I’ll go with the home team and their proven quarterback over the road team on a short week, with either two inexperienced QBs – one injured and one shell shocked. The views and opinions expressed are those of the author and do not necessarily reflect the views or opinions of the publisher of this website. Neither the author nor this website promote or advocate gambling. This is solely for entertainment purposes only. If you or someone you know has a gambling problem, please call 1-888-ADMIT-IT. This entry was posted in Patriots News, Uncategorized and tagged 2016 NFL Season, AFC, betting line, CBS, Denver Broncos, New England Patriots, odds, Patriots, Pats, Pittsburgh Steelers, San Diego Chargers, television, tv, vegas, Week 7 on October 12, 2016 by John Morgan. Week six kicks off with what should be a pretty good game on Thursday Night with Denver visiting San Diego. While the Chargers are only 1-3 they have held a 4th quarter lead in every game this season. Last time the Bolts played Denver, in Week 17 of the 2015 season it was the same story. The Chargers led 20-17 in the fourth quarter, but a 23-yard touchdown run by Ronnie Hillman with under five minutes remaining gave Denver their fifth straight victory over San Diego. The Patriots host Cincinnati and are listed as seven-point favorites. Last week the Bengals handled Miami with ease, though a disconcerting habit of settling for field goals kept the final score relatively close at 22-7. The Bengal defense looked much better with the return of Vontaze Burfict from his suspension for head hunting. If you recall Burfict completely lost his poise at the end of a playoff game in January against the Steelers with a dumb (and vicious) hit on Antonio Brown. 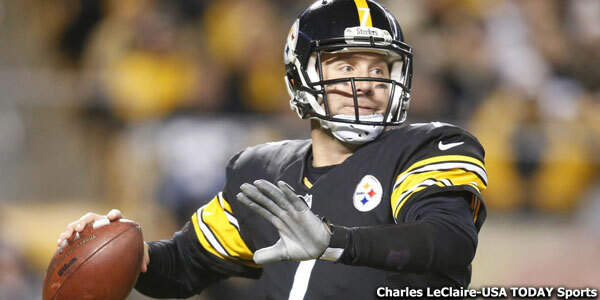 The penalty – along with ensuing personal foul penalty on Adam Jones – gifted the Steelers with a game-winning field goal. Elsewhere in the AFC East Buffalo is a 7-point home favorite versus San Francisco, Miami is a 4½ underdog at home against the Steelers, and on Monday night the Jets are 6½-point dogs at slumping Arizona. At first glance the best bets appear to be Houston (-3) vs Indy and Pittsburgh (-4½) at Miami. Here are all of the early advanced betting lines for NFL Week Six. Carolina has no early line due to the uncertainty of Cam Newton. Minnesota and Tampa Bay are off with a bye. As for tomorrow night’s game, nothing cures a slump like a game against a bad team such as San Francisco. Even with a backup quarterback the Cardinals still have the better offense. San Francisco has given up an average of 36 points per game over the last three weeks. Drew Stanton won’t have to do much other than hand off to David Johnson (4.7 yards per carry, 128 yards from scrimmage per game). This entry was posted in Patriots News, Uncategorized and tagged 2016 NFL Season, AFC, AFC East, betting line, Cincinnati Bengals, Denver Broncos, New England Patriots, odds, Patriots, Pats, San Diego Chargers, television, tv, Week 6 on October 5, 2016 by John Morgan. Last week the New England Patriots vaulted in to the number one seed in the AFC by virtue of the defensive mastery over the Houston Texans, coupled with losses by the Cincinnati Bengals and Denver Broncos. When the Miami Dolphins lost to the New York Giants Monday night the Pats also clinched their seventh straight AFC East title. Elsewhere the Arizona Cardinals also clinched a playoff spot and the Carolina Panthers clinched a first-round bye; on the other end of the spectrum six teams joined the Cleveland Browns as being officially eliminated from the playoffs. In the AFC there are essentially three playoff races: the Patriots, Bengals and Broncos vying for home field advantage throughout the conference playoffs, or at least a first-round bye; the Colts and Texans (and to a lesser extent, the Jaguars as well) playing for the AFC South title and the number four seed; and the Steelers, Chiefs and Texans battling for the wild card spots. Over in the NFC there are realistically only two playoff races remaining. For all intents and purposes the Panthers will be the number one seed, Arizona number two, and Seattle will claim the number five seed as the top wild card. One of Green Bay and Minnesota will win the NFC North and become the number three seed; they will play at home to the other club, who will become the number six seed. The other playoff race is of course that of the NFC East; one of the Redskins, Giants or Eagles will have to represent that division, even though nobody seems to want it or deserve it. In both conferences the race for the number five seed is nearly as meaningful as getting a first round bye. Both of the number five seeds will most likely be playing against a team with a .500 (or losing record). On the other hand the number six seed will have to go on the road against a ten or eleven-win club. Note: for the sake of clarity and to reduce the risk of headaches I have not included any scenarios involving ties. A 1-6 record at home, including a loss to the Niners? Huh? 14.5 points per game – pathetic. This entry was posted in Uncategorized and tagged 2015 NFL Season, 2015 Playoff Picture, AFC, AFC East, AFC North, AFC South, AFC West, Arizona Cardinals, Atlanta Falcons, Baltimore Ravens, Buffalo Bills, Carolina Panthers, Chicago Bears, Cincinnati Bengals, Cleveland Browns, Dallas Cowboys, Denver Broncos, Detroit Lions, Green Bay Packers, Houston Texans, Indianapolis Colts, Jacksonville Jaguars, Kansas City Chiefs, Miami Dolphins, Minnesota Vikings, New England Patriots, New Orleans Saints, New York Giants, New York Jets, NFC, NFC East, NFC North, NFC South, NFC West, Oakland Raiders, Philadelphia Eagles, Pittsburgh Steelers, San Diego Chargers, San Francisco 49ers, Seattle Seahawks, St. Louis Rams, Tampa Bay Bucs, Tennessee Titans, Washington Redskins on December 18, 2015 by John Morgan. There are a couple of super new books that will be of great interest for Patriots fans out there and as we get a chance we’ll review them, we will get the word out for some of the best and entertaining reads. 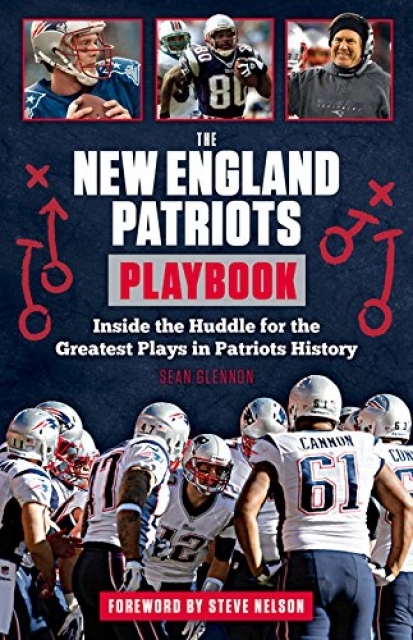 One of the books we’ve been waiting for is Sean Glennon’s newest work, “The New England Patriots Playbook: Inside the Huddle for the Greatest Plays in Patriots History” put out by Triumph Books. Glennon should be well known to Patriots fans; this is his fourth book on the Patriots and his last one, Tom Brady vs the NFL, The Case for Football’s Greatest Quarterback was an outstanding effort. Glennon is also very active on Twitter and has been quite visible during the latest Brady vs the NFL goings on with the Deflategate fiasco. Glennon’s latest work takes one on journey back to some of the most memorable plays, both good and bad in Patriots history. It is started off with a forward from Patriots Hall of Fame linebacker Steve Nelson. Nellie recounts some of his biggest memories including the infamous phantom roughing the passer penalty in the 1976 playoff game against the Oakland Raiders, the “Ben Dreith Game”. Of course everyone knows the Malcolm Butler interception against the Seahawks in last season’s Super Bowl but more youthful Pats fans may not remember Jim Nance’s 65-yard touchdown run against the Bills in 1966 or when the Patriots shocked the back-to-back Super Bowl Champion Dolphins on the opening weekend of 1974 behind 5’5, 170 pound Mack, “Mini-Mack” Herron. Of course there are numerous plays that take place in the Patriots dynasty of the Bill Belichick era including perhaps the most clutch kick in NFL history, Adam Vinatieri’s 45 yard field goal in a blizzard in the old stadium in January 2002 that tied the game and sent it into overtime. Of course Vinatieri had his memorable kick in the Super Bowl against the Rams that upset the “Greatest Show on Turf”. Tom Brady’s overtime pass to Troy Brown for an 82-yard touchdown in 2003 put the Patriots in the divisional driver’s seat that they haven’t vacated over a decade later. Brown also had the fumble strip of Marlon McCree after McCree’s interception of Tom Brady that led to an improbable Patriots playoff victory over the San Diego Chargers in 2006. That game led to a wild Patriots celebration at midfield that incensed Bolts running back LaDanian Tomlinson. The Patriots mimicked Shawne Merriman’s “Lights Out” sack dance following the victory. 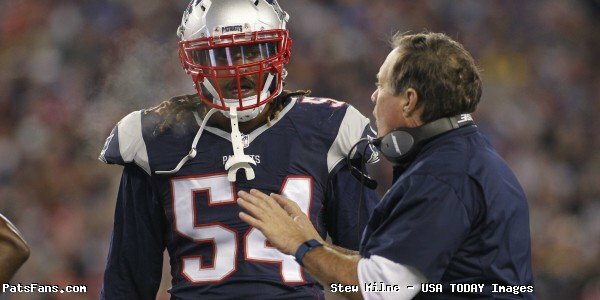 Tomlinson took great exception saying the Patriots “showed no class…maybe it comes from their head coach.” It is fitting that he bandied about the class word…since the Patriots taunted the Bolts with a dance, that San Diego taunted its opponents with all season….hello pot, meet kettle. Rodney Harrison’s interception to seal the Super Bowl against the Eagles in the Patriots third championship in three years is a personal favorite. Harrison was an integral part of the Super Bowls XXXVIII and XXXIX and brought a level of toughness to the Patriots secondary. Of course no book on the Patriots successes is complete without a bunch of references to destroying the Colts Super Bowl dreams time after time. The Tom Brady – Peyton Manning rivalry has been notoriously one-sided, even after his move to Denver. But the Colts stories have a nice lead-in to this week’s game in Indy. There’s even a chapter at the end of the book with all of the heartbreakers that the team has suffered in its 55-year history….and there are many. David Tyree’s Velcro helmet catch, the blowout in the 1985 Super Bowl to the Bears, the infamous 4th & 2 call against the Colts….they’re all here. This entry was posted in Patriots Commentary, Patriots News and tagged Adam Vinatieri, Ben Dreith, Bill Belichick, Jim Nance, Julian Edelman, LaDanian Tomlinson, Mini-Mack Herron, New England Patriots, NFL, Oakland Raiders, Patriots, Rob Gronkowski, Rodney Harrison, San Diego Chargers, Steve Nelson, Super Bowl XXXIX, Super Bowl XXXVIII, Tom Brady, Troy Brown on October 17, 2015 by Steve Balestrieri. Despite an abundance of injuries, NFL week five’s Monday night football game should be a good one. Although the two clubs are just 2-2, the San Diego Chargers and Pittsburgh Steelers both have legitimate playoff aspirations for this 2015 season. Pittsburgh is coming off a 23-20 home overtime loss to the Ravens a week ago Thursday, while the Chargers eked out a 30-27 home victory over the Browns last Sunday. Both teams are currently 2-2 and are seeking to keep within two games of undefeated leaders in their respective divisions (the 5-0 Denver Broncos and Cincinnati Bengals). Game kicks off at 8:30 pm eastern time and is broadcast on ESPN. San Diego entered the week with the NFL’s number one offense (since surpassed by the Patriots), averaging 421 yards per game. Quarterback Philip Rivers has single handily carried the Charger offense, completing 71% of his throws and averaging 312 passing yards per game. San Diego will be without three starters on offense: LT King Dunlap (concussion), LG Orlando Franklin (ankle) and WR Stevie Johnson (hamstring), and has five other starting or key offensive players injured (C Chris Watt, RG D.J. Fluker, OL Chris Hairston, WR Jacoby Jones, WR Malcom Floyd). The Chargers do get TE Antonio Gates back after serving a four-game suspension for a banned substance, but the biggest obstacle for San Diego will be giving Rivers a clean pocket behind a banged-up makeshift offensive line. The Pittsburgh secondary has improved since the debacle against the Patriots in week one, but it is still a work in progress. That group has been helped out by an effective pass rush; the Steeler front seven versus San Diego’s o-line will be the key to the game. If Rivers has enough time he is capable of torching the Pittsburgh defensive backfield with throws to Gates, WR Keenan Allen (33 receptions for 387 yards and 3 TD) and old friend Danny Woodhead (16 catches for 203 yards; 347 yards from scrimmage and 7.1 yards per touch). The Steelers will have had 11 days to get Michael Vick acclimated to the offense, so he should be more productive than he was a week ago. With Antonio Bryant (an NFL-best 119.5 yards receiving per game) on the field, San Diego cannot focus on stopping RB Le’Veon Bell. Bell is averaging 4.7 yards per carry and 95.5 yards rushing per game, and should feast on a San Diego defense that is allowing 4.9 Yards per carry (third worst in the NFL). Both the Steelers and Ravens have had a tendency to let down and underachieve in games after they play each other; we saw a glimpse of that Sunday when Baltimore was defeated at home by the Cleveland Browns. Add in OC Todd Haley‘s often perplexing and overly conservative play calling, and Pittsburgh is far from a lock to win this game – despite San Diego’s woes on defense (they have allowed at least 24 points in every game thus far) and their MASH-unit of an offensive line. The Steelers are 2-7 west of the Rockies in the Mike Tomlin era; the last time Pittsburgh won a game in the pacific time zone was ten years ago. To get an idea of how long ago that was, Ben Roethlisberger was in his second year in the NFL. Prediction: I don’t feel strongly either way in this game; it’s easy to find reasons why either team should win (or lose). I’ll go with the Chargers to win, but Pittsburgh keeping it close enough to cover before a Tomlin brain cramp gives the game away. This entry was posted in Uncategorized and tagged 2015 NFL Season, against the spread, Antonio Bryant, Danny Woodhead, ESPN, Keenan Allen, Le'Veon Bell, Michael Vick, Mike Tomlin, Monday Night Football, NFL, odds, Philip Rivers, picks, Pittsburgh Steelers, predictions, San Diego Chargers on October 12, 2015 by John Morgan.